Just Ask Domestic Services is different from other domestic cleaning companies. They subsidise services to the vulnerable people in their local community, who could otherwise not afford domestic help. This is achieved by using the profits generated from clients who are able to pay the normal fees, to subsidise the service to vulnerable and needy groups. Just Ask’s service user portfolio is varied, covering a wide range of social needs for local residents of all age groups. Our primary focus is to provide support to our elderly and most vulnerable service user group by providing home help services and/or personal care support to help them live safely and independently in their own homes. We achieve this by providing person-centred services at affordable prices, delivered by a team of support workers dedicated to making a difference to the lives of others. As Just Ask is a community interest company and therefore non-profit making, we offer a more flexible and person-centred approach to the services we provide that isn’t constrained by the need to make profit. We offer subsidised home help services to service users in receipt of pension credit. We have identified that many of this group have significant needs for support with household chores, but in many cases the costs are unaffordable without our subsidy being given. We have also introduced a subsidised service for our home care service users. This subsidy means that qualifying service users benefit from a half hour visit for the cost of a normal 15-minute visit. We introduced this subsidy to improve the quality of home care services provided and reduce social isolation by giving the support worker more time with the service user for social interaction. We offer subsidised services because we use profits that we make from service users who pay our normal fees towards the subsidy. Our ultimate aim is to reduce the effects of social isolation and improve the well-being in the elderly community by creating a charitable organisation that would be linked to the existing community interest company. The new charity that we hope to create would use volunteers to provide a befriending service to elderly people. By developing relationships and building trust, the volunteers could outline the benefits to the individual that they could experience by having regular home help or home care services. By introducing the support services that an elderly person might need coupled with continued befriending service, would have a significant impact on the individual through a reduction in social isolation and improved well-being. It would also result in a reduction in the likelihood that that individual might have an accident in their home by attempting tasks that are unsafe for them to do. Just Ask prides itself on the positive impact that we have on our service users by providing personalised services to meet the needs and expectations of a largely elderly service user portfolio. More importantly, we give them the time and support that they need to improve the quality of their lives. We deliver this support through a dedicated and caring team of support workers. Just Ask is committed to the employment of local people and offers a flexible, supportive and ethical working environment. 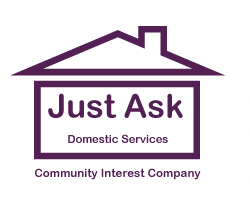 Just Ask provides home help, which includes cleaning, washing and ironing clothes, meal preparation, companionship, shopping, accompanied visits to doctor and hospital appointments. Our home care service includes most aspects of personal care. We work in close partnership with other voluntary and statutory sector agencies within the areas we serve, such as Yorkshire Housing, Craven District Council, Greatwood Community Centre, Carers Resource and many local health professionals to identify and provide services to the most vulnerable local people. We also work with these agencies to encourage the local organisations serving the community to work with us to identify any gaps in local services that they are experiencing. A growing elderly population will need increasingly higher levels of support to help them remain safely in their own homes. Just Ask provides the services that individuals need to maintain their health and well-being. However, many individuals need home help support but there currently isn’t any financial support for elderly people requiring home help services. Just Ask offers a unique answer to this problem through the subsidies that we can offer. Many of our elderly service users have no family or family members live too far away to provide day-to-day support. Just Ask support workers notice if a service user is unwell or experiencing problems and will advise family members of any changes to health and well-being. We frequently escalate concerns to involve a home visit from a GP or advising our concerns to a social worker. This escalation of our concerns has on many occasions prevented an individual from hospital admittance because the issue is tackled early. This proactive and preventative action does increase our claims of helping elderly people remain safely in their own homes. We work closely with social workers, mental health teams, district nurses and GPs to offer our observations about service users health and well-being. We work with stakeholders develop personalised care plans and strategic plans and reviews to improve the quality of life for individuals who are experiencing problems. A typical example of this would be where we are aware, through regular visits, of a service user having an increased number of falls at home. Stakeholders are often not aware of this change and increase in risk to a service user because they ‘don’t want to make a fuss’. Through collaboration with various stakeholders, we share our concerns and offer our suggestions as to how we could help with minimising risk in the future by implementing often small changes. We perform annual service reviews using questionnaires, which asked service users to score and offer feedback on the services that we provide. From the responses we receive, we have identified areas where improvements to our service could be made and introduced changes to ensure that a reoccurrence of the issue is less likely. We currently review the effectiveness of changes that we have introduced by using anecdotal evidence offered by service users, for example, services users saying “since you introduced that change, we’re happier with the service”. However, we want to improve the effectiveness of our service questionnaires and plan to introduce a section that asks how a service user perceives the changes to their overall health and well-being because of using the services offered by Just Ask. This new section will ask for a score as to how they were before using our services and a score now that they are using us. Our proposed new collection of measurable data will enable us to report accurately the difference that we make to people’s lives rather than offering just anecdotal evidence. We intend to share this new data, when it’s available later this year, with all our stakeholders to support the anecdotal evidence that we have provided, or they have acquired in the past. We estimate from anecdotal evidence that we gather from the service user, approximately 90% of service users experience an improvement to their well-being (largely because they feel better that their house is tidier, safer because it’s less cluttered and they no longer feel the need to attempt to clean areas that might be unsafe for them to do so). Many service users also an improvement in their mental health because they feel supported and know that they have someone cares. Her mental health was declining because she could not longer clean her house as effectively as she would like. We were asked to visit three times a week to clean to a meticulous standard, which resulted in her anxiety being greatly relieved. Over several years her physical health declined dramatically so we were asked to provide support with her personal care as well because she had developed a very good rapport and trust with the support workers who had been visiting her. Further declines in her health resulted in numerous hospital visits generally late in the evening because of the unpredictability of her health condition. The support workers would take her to hospital and stay with her, often returning close to midnight. They did this in their own time and because of the compassion that they had for her vulnerability. The support workers continue to provide levels of support above and beyond expectations because this lady has no family and few friends to support her. She has repeatedly expressed her sincere gratitude for helping her through what is a very stressful time of her life. A severe attack of pneumonia a year ago resulted in her being hospitalised for five weeks. We visit six days a week to assist her with various household chores, meal preparation, shopping, hospital and doctor appointments. She has said that although this support is important to her, the fact that we visit most days means that her anxiety has greatly reduced because she knows that there will always be somebody visiting in the morning to check that she is ok.
She also has a lifeline of support because she knows that she can call at any time should she need assistance with anything. They were struggling to keep on top of cleaning, ironing and other household tasks. They required quite a lot of support but were unable to afford our normal costs. We introduced our cleaning and ironing services at our subsidised rate, which meant that they feel happier that the things around the house are being done and they find the subsidised rates affordable. We offer subsidised home help services to service users in receipt of pension credit. We have identified that many of this group have significant needs for support with household chores, but in most cases the costs are unaffordable without our subsidy being given. We have also introduced a subsidised service for our home care service users. This subsidy means that qualifying service users benefit from a half hour visit for the cost of a normal 15-minute visit. We introduced this subsidy to improve the quality of home care services provided and reduce social isolation by giving the carer more time with the client for social interaction. We are able to offer subsidised services because we use profits that we make from service users who pay our normal fees towards the subsidy. Our staff often stay longer than the allotted time with a service user, rota permitting. This is because they are passionate about ensuring all tasks are completed, but more importantly, many service users are isolated and see very few people and miss social interaction, so a extra few minutes to chat with them can often improve their well-being and reduce loneliness. Our average annual investment in subsidies for qualifying clients is 4%-4.5% of turnover; approx. £10,000 per annum. Most care and home help support organisations similar to ourselves only pay their staff for the time that they spend with service users. They also rarely build in any travel-time between visits, so consequently, staff are under pressure to arrive to service users on time. We pay travel time between service user visits, which makes a significant difference to our employees salary. We also build-in enough time for the journey from one service user to the next; this is achieved using our advanced care planning software. This means that our service users get the time that they are paying for and our staff are paid ethically for the time that they are working and travelling. We only use environmentally friendly cleaning materials that are tested and achieve ISO14001. We also refill handheld pump-bottle dispenser bottles from bulk containers, which themselves are recyclable. This means that we have virtually eliminated waste that goes to landfill sites. We also have reduced the amount of mileage that our staff do on company business by maximising the benefits that our job scheduling software can offer. This software uses Google maps information and tells us the mileage and travel-time between service users, which means that we can plan travel time effectively and minimise the mileage required to cover work commitments, thereby reducing the fuel that is required. As mentioned earlier, we pay the travel time for our support workers between service users, whereas many in our sector don’t. This ethical approach to the payment of travel time for support workers means that the approximate average travel time paid in their salaries equates to an additional 8.5% or approximately £14,500 per annum paid by the business.